Economic geologist Nigel Maund provides a fundamental analysis on a company developing a gold and silver mine located close to Mexico City. Almaden Minerals Ltd. (AMM:TSX; AAU:NYSE) was founded in 1980. AAU is listed on the NYSE and TSX with a total of 111.6 million ordinary shares in issue (June 30, 2018), plus 10 million options with a strike price of C$1.26 (against a current TSX stock price of C$0.71) and 13 million warrants with a strike price of C$1.92. Management and directors hold 5% of the stock. Other largest shareholders are as follows: Institutions 12%; Ernesto Echavarria 7%; Tocqueville Gold 5% and Sprott Asset Management 2%. The company has no debt and as at 30th June 2018 has $12.5 million in cash. Market capitalization stands at US$59.93 million. AAU's Enterprise Value is US$47.43 million. Almaden Minerals owns 100% of the Tuligtic project in Puebla State, Mexico. Tuligtic covers the Ixtaca Gold-Silver Deposit, which was discovered by Almaden in 2010. The location of the project is given on the figure below, where it is apparent that it is located amidst favorable infrastructure and sources of skilled labor, power and water, within a few hour's drive of the Mexican capital city, Mexico City. The Ixtaca deposit currently hosts a Proven and Probable reserve of 65.1 million tonnes grading 0.62 g/t gold and 37.7 g/t silver or 1.29 million ounces of gold and 78.8 million ounces of silver, as shown on the summary table below. The Ixtaca epithermal gold-silver vein stockwork project occurs in deformed carbonate rocks about two kilometers southwest of the Tuligtic's porphyry copper zone (drilled in 2009-2010). The gold and silver are hosted within medium- to high-grade quartz–sulphide–electrum veins and veinlets within otherwise barren but hydrothermally altered limestone country rocks. In May 2017, Almaden filed a Preliminary Feasibility Study (PFS) of the Ixtaca deposit, which estimates an economically robust project generating an after-tax IRR of 41% assuming US$1250/oz gold and US$18/oz silver prices (22nd October prices are US$1,227/ounce gold and US$14.63/ounce silver). The project would produce a total of 1,043,000 ounces of gold and 70.9 million ounces of silver over a 14-year mine life. 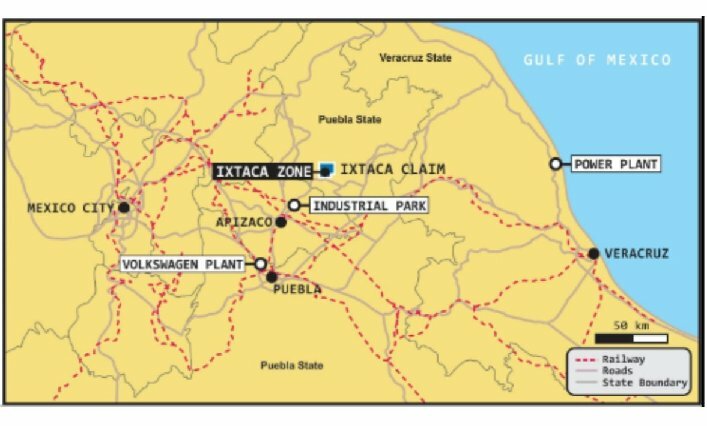 It is worth noting, at this juncture, that as both precious metals are at a secular technical bottom, and the fact that silver is now grossly undervalued relative to gold, the Ixtaca project is highly leveraged to both the gold and even more to the silver price, given that the resources comprise a bulk tonnage low-grade open-pit mining project.